The Muppets have been around for years and we all know the characters from The Muppet Show which was created by Jim Henson. I adored the Muppets and was very excited and happy to see this collection and learn that they've made another film in time for Christmas.There's still a bit in me which loves them, I think as soon as you see the characters they make you smile. I was very lucky to receive 2 shades from the new collection to review and share my thoughts with you all on my blog. The collection consists of 12 shades which are all eye catching, a real mix of finishes and colours. I am SUPER excited to share my photos because for this review no words can capture how beautiful both these polishes actually are so I'm just going to dive straight in with a gallery of photos to show you. Oh and before you see the gallery please excuse my sad nails they just don't seem to grow at the moment I need to keep them painted to make them stronger. Warm & Fozzie is a beautiful shade for the Autumn, a mix of copper and gold metallic hues give a warm finish which looks great on the nails. I tried to be festive and tried the red O.P.I shatter polish over the top on my ring finger, I left my baby finger bare so you can see the difference. I can see me wearing this shade all through the Autumn and winter. 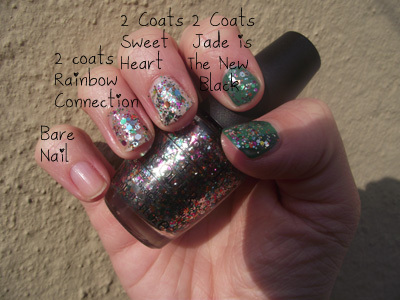 I took swatches of Rainbow Connection over the top of 2 different O.P.I polishes, I thought I would try a very soft subtle background polish and opted for Sweet Heart which would really show off how pretty Rainbow Connection is. Next I thought a nice bold cream polish would compliment Rainbow Connection and was drawn to Jade is the New Black. Well OMG I will let the pictures do the talking! I love this combo so much and it screams Christmas, I have nick-named this mani Christmas Tree. 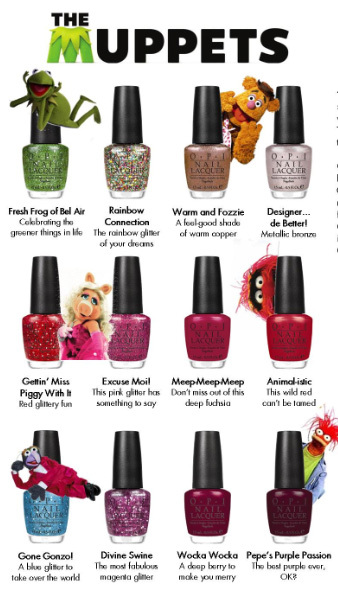 The Muppets Christmas Collection 2011 is available now to purchase from www.lenawhite.co.uk and retail at £10.50, I recommend you snap any of these shades up before they sell out because they are so pretty and festive! Below shows you the other polishes in the collection, I think they all look fab! Thanks for reading which shades do you want?? Do you like my Christmas Tree nail look?